Rep. Ilhan Omar (D., Minn.) accused a Republican lawmaker without evidence of being "compromised" Tuesday. In the video, Graham slammed then-candidate Trump for his character and views. At the time, the senator and Trump were dueling for the 2016 Republican nomination. Since Trump's election, Graham has worked closely with the president on a range of issues, and has generally been supportive of his agenda, to the puzzlement of many in the media. Omar's unsubstantiated accusation came hours after MSNBC's Stephanie Ruhle implied that Trump has kompromat on South Carolina's senior senator. During a panel discussion on the relationship between the two, Ruhle jumped in with the suggestion. "It could be that Donald Trump or somebody knows something pretty extreme about Lindsey Graham," Ruhle said before ending the segment. "We’re gonna have to leave it there," she concluded. 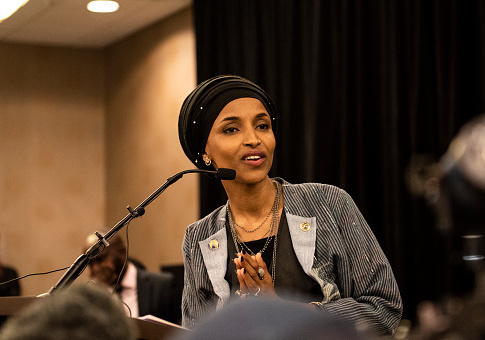 The Washington Free Beacon reported Tuesday that Ruhle's accusation, and now Omar's, follow an unsourced allegation by Jon Cooper, a super PAC Democratic official. He claimed Graham was "being blackmailed by the Russians" over "some pretty serious sexual kink." To date, the MSNBC anchor, Democratic fundraiser, and elected official have yet to produce any evidence for the smear. Philip Klein, executive editor of the Washington Examiner, wrote an editorial Tuesday titled "It doesn't take a crazy conspiracy theory to explain why Lindsey Graham is supporting Donald Trump." In it, Klein offered that Graham's relationship with Trump can be explained by the fact he "is running for reelection in 2020 in a state where Trump's approval rating is 83 percent among Republicans." Trump and Graham have worked together to support two Supreme Court justices, pass criminal justice reform, and pass a number of other legislative measures. However, they have also broken on a number of issues, including Trump's decision in December to withdraw U.S. troops from Syria. The two have managed to work through those disagreements, albeit with an occasional barbed tweet. So hard to believe that Lindsey Graham would be against saving soldier lives & billions of $$$. Why are we fighting for our enemy, Syria, by staying & killing ISIS for them, Russia, Iran & other locals? Time to focus on our Country & bring our youth back home where they belong! As of press time, Omar's original tweet remained posted without supporting evidence. This entry was posted in Politics and tagged Donald Trump, Ilhan Omar, Lindsey Graham, Stephanie Ruhle. Bookmark the permalink.